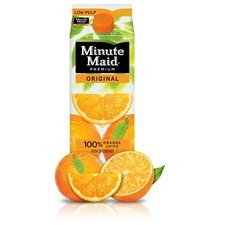 Coca-Cola, maker of the Minute Maid and Simply Orange brands, is using its balance sheet and distribution reach to methodically build a global juice machine. That includes the U.S., Coke’s largest market, accounting for one-third of its volume sold. PepsiCo (PEP), led by its Tropicana brand, commands a 40 percent volume share of the $4.6 billion U.S. market for not-from-concentrate juices, compared with 28 percent for Coke, according to Euromonitor. Globally, the market researcher says, Coke gets about $13 billion in revenue annually from pure juice and juice drinks. “You see them focusing on still beverages because that’s been outgrowing sparkling drinks for several years now,” says Thomas Mullarkey, an analyst for Morningstar (MORN) in Chicago. At the core of Coke’s plan in the U.S. is 100 percent not-from-concentrate OJ, for which consumers are willing to pay as much as a 25 percent premium. Yet producing the beverage is far more complicated than bottling soft drinks. Juice production is full of variables, from weather to regional consumer preference, and Coke is trying to manage each from grove to glass. 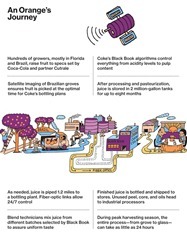 In bucolic Auburndale, an hour south of Disney World, Coke has spent $114 million in recent years expanding its premier U.S. juice bottling plant, which it claims is the world’s largest. 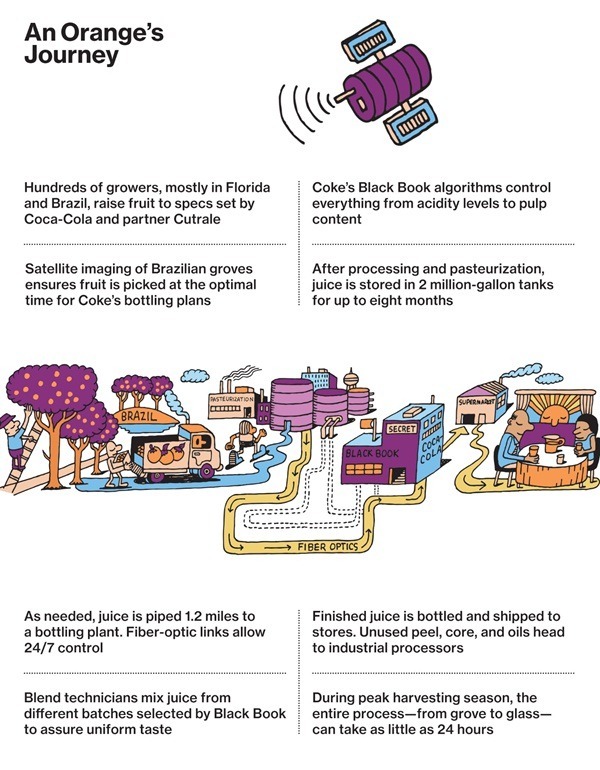 It’s here that Coke has perfected a top-secret methodology it calls Black Book to make sure consumers have consistent orange juice 12 months a year, even though the peak growing season lasts about three months. “We basically built a flight simulator for our juice business,” says Doug Bippert, Coke’s vice president of business acceleration.